The following article originally appeared in The Lantern, the newsletter of Historic Red Clay Valley Inc., owner and operator of the Wilmington & Western Railroad. To subscribe to our newsletter and learn more about the history and activities of the railroad, become a member here. During the 1980s and 1990s, a Wilmington & Western Railroad steam train made an annual trek to downtown Wilmington to participate in the city's "Transportation Day." The route for the trip included the ex-Baltimore & Ohio (B&O) Market Street Branch from Elsmere Junction to the Wilmington West Yard. Between the junction and the yard, the train would pass a tall pole with a contraption that included a 3½-foot long yellow and black metal arm at its top. Participants in the early Wilmington trips remember watching the arm rise from a horizontal to a vertical position just before they started back to Elsmere Junction, and seeing it fall back to horizontal as they passed. This device was one of the last of a dying breed – the railroad semaphore signal. Semaphore signals were first developed for railroad use in England during the 1840s from earlier semaphore communication telegraphs. Once adapted for railroad use, they allowed information to be transmitted to the engineer and/or conductor of a moving train. A success, they crossed the Atlantic in the 1860s and dominated American railroad signaling from the 1890s through the 1930s. They supplanted earlier technologies involving flags, balls, vanes, banners and disks. A semaphore consists of a pole or other support structure with one or more movable arms called "blades." The position of the blades conveys specific information to the train crew. For night, colored lenses or "roundels" held in "spectacles" attached to the blades are moved in front of a lantern. The shape and color of the blades and the presence of additional "marker" lights or signs on the pole provide additional information. Each combination of blade positions, colors, shapes, lights and markers is an "aspect" and the message it represents is an "indication." The indication might refer to the presence of another train ahead, the speed or speeds the engineer should employ on upcoming track, the route expected through an upcoming series of switches, or the need to obtain train orders. Knowing all the possible semaphore signal aspects and what each indicated for a particular railroad was a required skill for engineers, firemen, conductors, and brakemen – just as it remains today with modern signal systems. Originally, semaphores were entirely mechanical. An operator moved the blades by throwing "Armstrong" levers (so-called because strong arms were needed) which were connected to the blades by rods and cranks. In the early 1900s electrically operated semaphores became available. Now, throwing a switch in the tower or closing a relay in an electric circuit, could energize motors that would move the blade or blades to the desired position. However, the reign of the electric semaphore was relatively short. The development of reliable, bright incandescent lights and widespread availability of electric power led to the invention of a variety of signals using only colored electric lights. These signals had the major advantage over semaphores of having few or no moving parts and therefore required little maintenance. 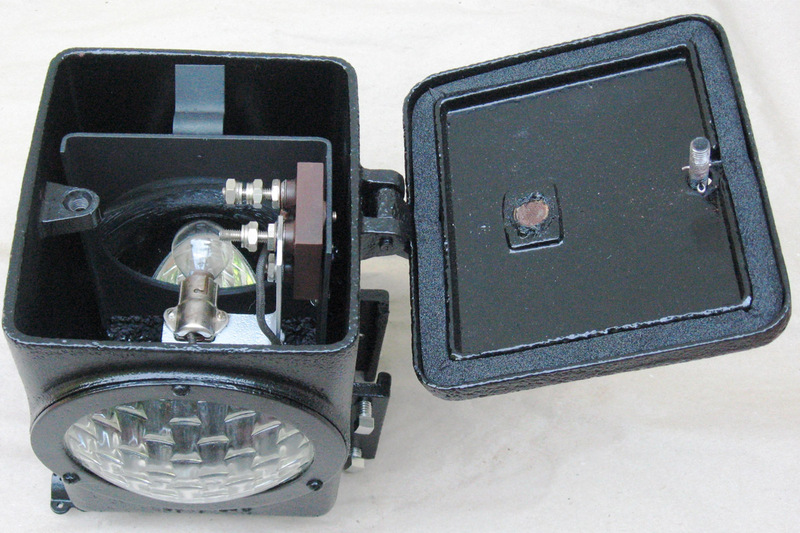 In 1924, the B&O began replacing its semaphores with the unique B&O Color Position Lights (CPLs). However, an ever-dwindling number of semaphores remained in service on former B&O lines throughout the rest of the 20th century. Many manufacturers and designs of semaphores existed. The most popular and widely used American electrical semaphore was the General Railway Signals Inc. (GRS) Model 2A, with over 25,000 installed. The standard Model 2A was an upper quadrant, 3-position semaphore, meaning it had three possible positions per blade: horizontal, diagonal up, and vertical up. The Market Street Branch semaphore was a GRS Model 2A. According to GRS information, it was sold to the B&O between 1917 and 1919, but its full history with the B&O is unknown. At some point prior to the end of World War II, it was installed on the Market Street Branch and used to signal permission to proceed for trains leaving the West Yard for Elsmere Junction. Junction-bound trains were forbidden to pass the signal at "Stop" – blade horizontal with a red light – under normal operation. 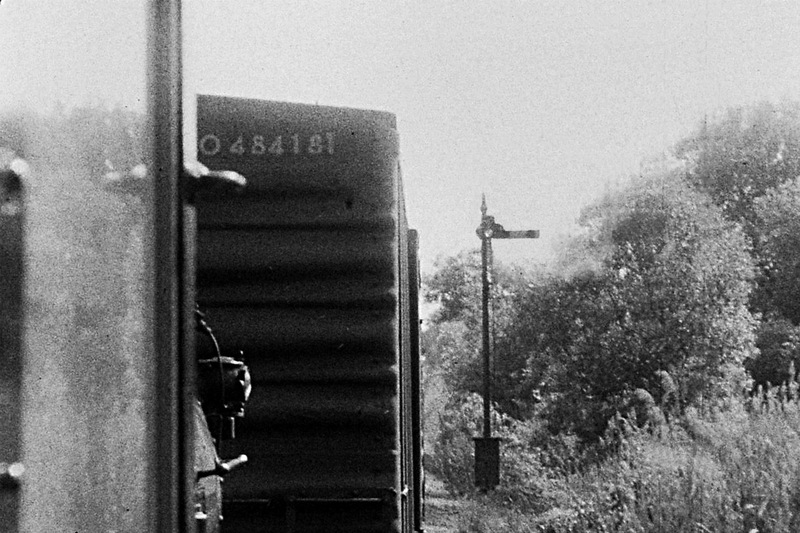 The train crew would contact the junction operator by telephone or (later) by radio. After the route was lined and verified free of traffic, the operator would set the semaphore to "Clear" – blade vertical with a green light. When the train entered the block, the signal would be set back to "Stop." In later years, a dispatcher in Baltimore controlled the signal. The Market Street Branch’s semaphore had an ignoble end to its service life with a mainline railroad. In the late 1980s, it ceased working due to neglect, and in the early 1990s its supporting pole collapsed. It was damaged by the fall and lay immersed in the water and mud of the trackside drainage ditch for at least a year. It was never replaced by CSX, the current owner and operator of trains on the Market Street Branch. Former Historic Red Clay Valley Inc. (HRCV) member David Jensen rescued the semaphore mechanism, spectacle and blade. After some restoration work, he placed them in his yard. In 2006, he donated them to HRCV and they were moved to the Wilmington & Western's yard in Marshallton. 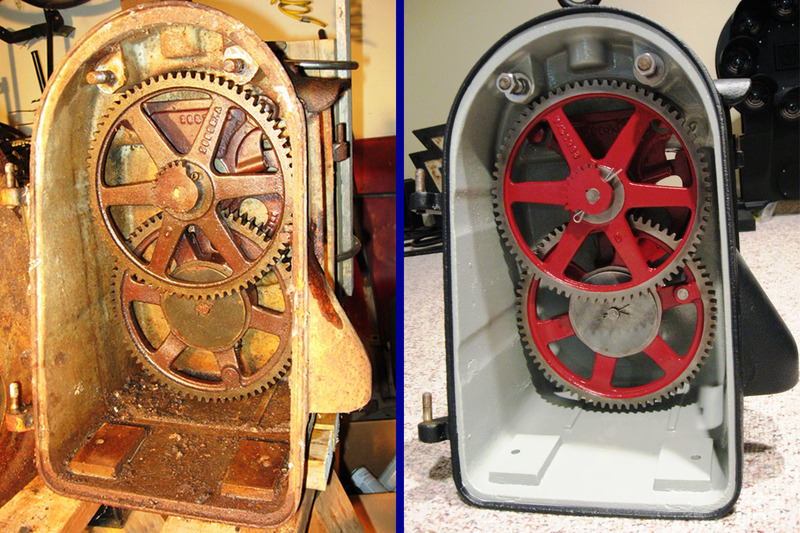 In 2010, the rusty mechanism was noticed by the author, who offered to carry out a full restoration. Completed in 2011, it was first displayed and operated at that year’s HRCV Annual Meeting and Banquet. The decision was later made to put the signal back in operation at Greenbank Station, replacing the existing color light signal. Thanks to generous grants from the National Railway Historical Society and the Amherst Railway Society, the financial means to do so became available. 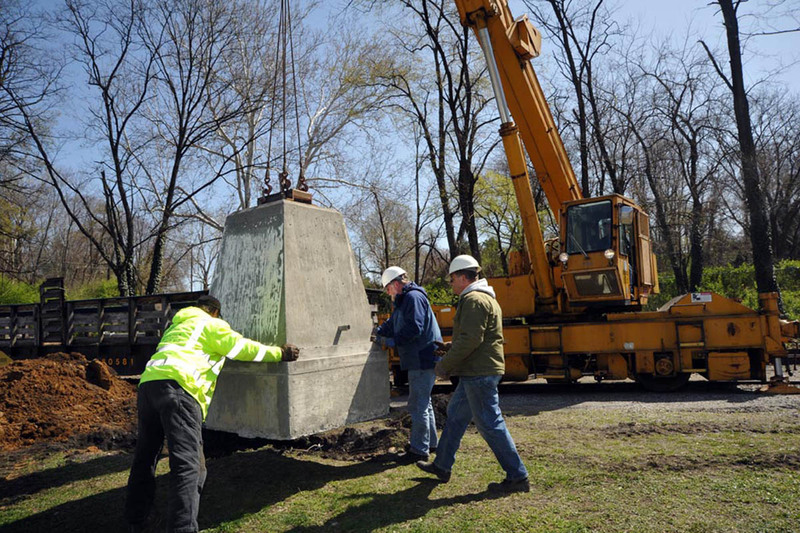 The work required to restore the nearly century-old semaphore was significant. A pole was found in a salvage yard near Cleveland, and a new ladder and platform assembly were fabricated using original plans. A nearly five ton concrete foundation was poured and set in place. Parts large and small were sand blasted and painted. The original spectacle and blade were repaired; proper colored glass roundels and a period-correct GRS lantern were found. A Block Signal Control Cabinet for Greenbank Station was built following original B&O plans, and more than a thousand feet of wire was run between the station and signal. All this was possible only through the efforts of a group of volunteers. Among those who contributed their time to the effort were Mark North, Jack North, Bobby Peoples, Peter Dirga, Mike Ciosek, Tim Cronin, Steve Jensen Jr., Jack Wentzell, Evan Schilling, Steve Jensen Sr., David Ludlow and the author. The culmination of the project came on May 6, 2012, when the fully operational semaphore greeted Engines 98 and 58 as they pulled into Greenbank Station for Pufferbelly Day. Since then, it has signaled the start of every trip on the Wilmington & Western, and with continued care should continue to do so for many, many years. A sight which was once as much a part of railroading as the sound of a steam whistle has been reborn in the historic Red Clay Valley. The author thanks David Watterson and David Jensen for information gathered during conversations.